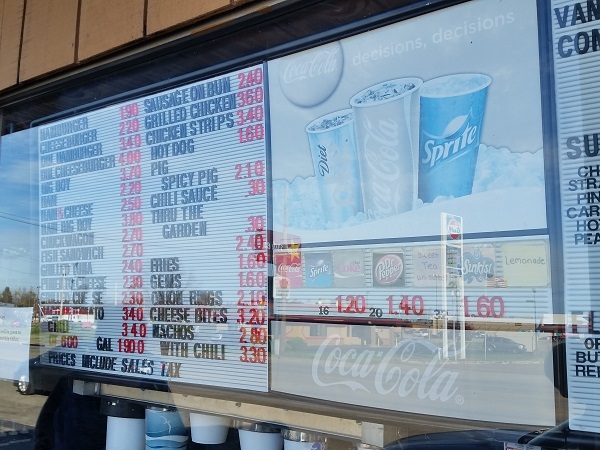 Big Dipper, Owensboro KY – Marie, Let's Eat! 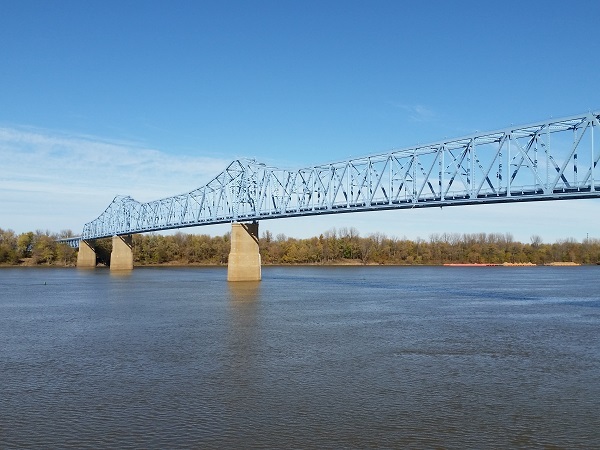 For about the only time on this trip, we were ahead of schedule, so after we left Ole South, we took a minute to drive across the beautiful Glover Cary Bridge from Owensboro into Indiana. It’s such a curious drive, going city, river, absolutely nothing. I wonder why there’s no development at all across the river. Anyway, on the way back across, we saw that J.R. Miller Boulevard is actually raised up above the small downtown area, home to a pretty busy retail area, a couple of museums, and a downright astonishing playground in Smothers Park. We decided that we could spare half an hour for our son to run around, which meant that our stop by the next restaurant on the schedule would be a real fly-by. But really, it was worth it, because the Smothers Park playground is easily among the very best we’ve ever seen. It’s just huge, a big, sprawling series of one climbing structure after another after another, with dozens of access points and slides, and most of it has wide “corridors” and ramps, too. If you are traveling through Owensboro, or taking an under-ten with you on a tour of barbecued mutton joints, give yourself some time here to get a little exercise. 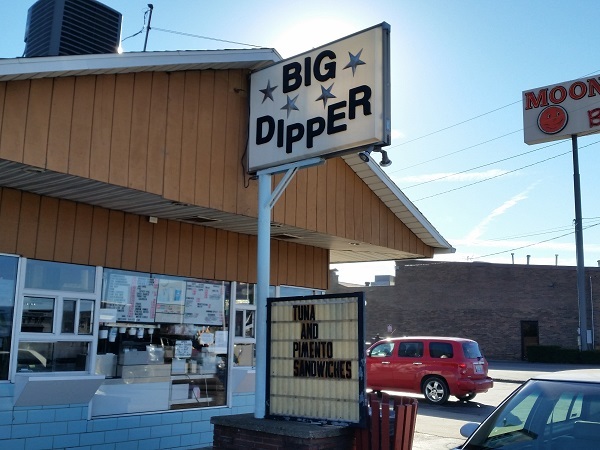 So we slipped behind schedule as we drove back to the western side of town to visit a sixty year-old dairy bar called Big Dipper. It’s located next door to the Moonlite Inn, and is owned by the same family. We still had four restaurants to visit, so we just stopped in for drinks. This was the after-lunch lull, so there were only five cars in the drive-through. At peak times, like I saw in June, the line is in two parts: the first surrounds the building and the second is the center turn lane on Parrish Avenue! People come for miles for a bag of their burgers and milkshakes. Marie had a grape slushie and I had a cherry milkshake, and the boychild, who had earlier pouted about having to drink water at lunch like we did, had given up his treat here in favor of a Sprite there. He pouted a little more for missing out. I enjoyed talking for a few moments with the staff and a fellow diner who came to the walk-up window. Owensboro loves the Big Dipper. Should circumstances ever conspire to keep me in town for more than two hours one day, I’ll come back and try a burger, and probably have another of these great cherry milkshakes. I’m sure the Big Dipper will still be around whenever that day comes. Restaurants this beloved aren’t going anywhere. Posted on December 18, 2015 August 24, 2017 by Grant G.Posted in dairy bars, dessert, kentuckyTagged dairy bars, dessert, kentucky, owensboro. Tuna and pimento sandwiches? What is this? Oh, a bit like the sandwiches made with diced green olive and cream cheese!